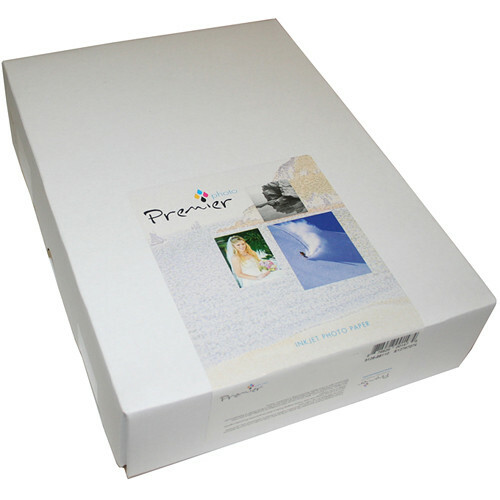 Sheet Size: 11 x 17"
11 x 17" 13 x 19"
Create vibrant colors with the bright white point of this 50-sheet pack of 11 x 17" Premium Super Glossy Photo Paper from Premier Imaging. The quality paper features a resin-coated base with a basis weight of 265 gsm and a thickness of 10.4 mil. Also, it has a rated opacity of 96% and whiteness of 98% as well as being both instant drying and water resistant. Additionally, it offers a smooth high gloss surface for showing off your images. Box Dimensions (LxWxH) 17.4 x 11.3 x 1.0"